The trade war Donald Trump is waging with China is shifting to a new phase as each new volley of tariffs pushes the world’s two biggest economies toward decoupling. Trump unleashed the latest tariffs barrage on Monday, provoking a response from China and leaving prospects for a solution to the dispute more distant than ever. As US demands for China to rein in industrial policies collide with Beijing’s unwillingness to contemplate change under duress, attention is now shifting to the eventual scale of collateral damage for the world economy. “This may be the beginning of the end of a major trend called globalization that created one of the periods of fast growth," said Tao Dong, vice chairman for Greater China at Credit Suisse Private Banking in Hong Kong. “Divorce will see a huge shift in supply chains," said Michael Every, head of Asia financial markets research at Rabobank in Hong Kong. “Vietnam and Thailand and maybe India win. So will Mexico. The US will win geo-strategically by hollowing out China as it has been hollowed out, preventing the Made in China 2025 plan and fracturing the world into a China and US camp with more limited economic connections. It’s a win for US power." “One goal of US officials is to use tariffs to incentivize US firms to pull their supply chains outside of China, though this isn’t a uniform view within the administration," said Michael Hirson, Asia director at Eurasia Group. “The ideal would be to bring production back to the US. Some officials would be happy with US firms simply moving to other countries and not having their supply chains so concentrated in China. That’s especially true in high-tech sectors." “The critical question is how much pain this entails. US firms risk losing their ability to compete against, say, German or Japanese companies that are able to benefit from keeping their access to low-cost supply chains in China." “The downstream effects on the US economy, especially if factories close or move overseas, could be very significant. Beijing’s fear is that this shift will accelerate rapidly. 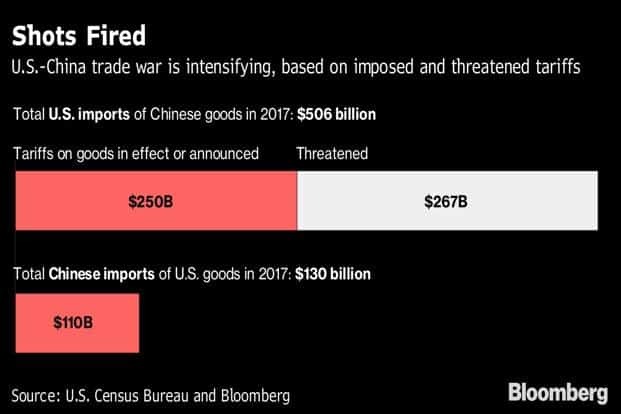 This is one reason why we expect Beijing’s retaliation to Trump’s tariffs to be fairly calibrated." “The main impact for the US would be on corporate earnings and the stock market, partly due to uncertainty caused by the speed of change," said Derek Scissors, chief economist at the China Beige Book. “China would face bigger problems. There are more substitutes for Chinese supply than American demand. A moderate trade conflict has no winner; in a serious one, the US loses far less." “If trade brinkmanship inspires a revolution in confidence and hiring in the US, then history might view this gambit kindly," said Dan Rosen, a partner at Rhodium Group LLC. “More likely, the limits on advance-economy coordination, looming signs of inflation, and close odds that midterm elections bring a phase change will work to make Team Trump’s sense of immunity to normal economic consequences temporary." “In the longer term, I suspect the trend growth in the world would moderate as trade slows down and investment slows down," said Credit Suisse’s Dong. “China will be much more focused on domestic markets in the future. Ironically, both US and China would emerge as better performing economies amid the trade war, because they are continental types of economy and are buffered by domestic demand."